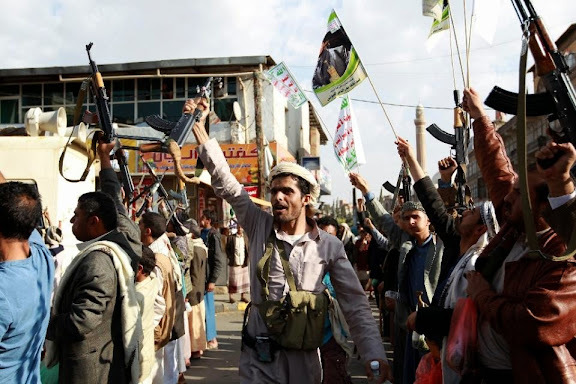 Yemen's Houthi fighters and their allies seized a central Aden district on Thursday striking a heavy blow against the Saudi-led coalition which has waged a week of air strikes to try to stem advances by the Iran-allied Shi'ite group. Hours after the Houthis took over Aden's central Crater neighborhood, unidentified armed men arrived by sea in an area of the port city which the Iran-allied Shi'ite fighters have yet to reach. A Yemeni official denied that ground troops had landed in Aden and a port official said they were armed guards who had disembarked from a Chinese ship trying to bring aid or evacuate civilians. COMMENTARY: It's possible a Yemen Army formation loyal to Hadi has been landed to contest Ansarullah's push towards the Crater district of southern Aden. There are also reports that Chinese military personnel landed to assist in the evacuation of Chinese nationals, which was reported as partially successful. A diplomat in Riyadh said Aden had come to symbolize Hadi's fading authority, meaning that Saudi Arabia could not afford to allow it to fall completely under Houthi control. But he said Riyadh's air campaign was so far geared more towards a slow war of attrition than an effective defense of the southern city. "Saleh and the Houthis are keeping the pressure on Aden, which is the weak point in Saudi strategy," he said. "I think the Saudis would put ground forces into Aden to recapture it if it falls. It is a red line for them." COMMENTARY: If the Saudis have planned for a long duration, aerial bombardment campaign, this would differ from the Israeli approach, which is short and sharp (other than the First Lebanon War, which is widely regarded as unsuccessful and ultimately counter-productive). Landing Saudi troops at Port Aden for an urban fight risks casualties, with an attrition war not favorable to the invading force. It also requires considerable logistical support, likely involving the United States. There are also reports of Royal Saudi Land Force suffering its first KIA during intense ground warfare against Ansarullah forces at the Saudi-Yemeni border. There may ebven be an inexorable pull for Saudi forces to foray into Yemeni territory, or even to invade in force. They named one of the escapees as Khaled Batarfi, a provincial al Qaeda leader who was arrested four years ago, security sources said. Soldiers loyal to Hadi clashed with the suspected al Qaeda fighters in Mukalla early on Thursday, residents said. COMMENTARY: This represents a serious blow to American counter-terror efforts, and considered an unfortunate byproduct of the Saudi-led coalition military effort directed towards Yemen. Gulf countries are locked in tough negotiations with Russia on a UN draft resolution to impose an arms embargo and sanctions on Yemen, diplomats said Wednesday. The six-nation Gulf Cooperation Council (GCC) has been negotiating with the five permanent Security Council members and Jordan on a text after Saudi Arabia launched an air campaign on Yemen on March 26, without a UN mandate. The GCC is no longer seeking a resolution that supports Saudi-led military action in Yemen, which Saudi Arabia argues is legal because it is being carried out at Hadi's request, diplomats said. But its push for an international arms embargo and sanctions targeting the Huthis has run into major opposition from Russia, which has friendly relations with Iran. During negotiations, Russia presented amendments to the draft resolution that would extend an arms embargo to all sides, including Hadi's forces in the conflict, diplomats said. Moscow also opposed sweeping sanctions against the Huthis and requested that a list be submitted of individual names of rebel leaders who could be targeted for a global travel ban and assets freeze. The UN's peace envoy for Yemen, Jamal Benomar, was in New York on Wednesday for meetings amid reports that Gulf countries were demanding that he be replaced. COMMENTARY: At the Arab sumit held last week at Sharm El-Sheikh, Saudi Foreign Minister Prince Saud al-Faisal accused Putin of hypocrisy after a letter by Putin was read aloud at the meeting and made public. Faisal referred to Russian assistance to Syria during that ongoing conflict. Now GCC members are seeking Russian approval of a UNSC resolution to assist their coalition war directed towards Yemen; a war not too dissimilar to Russia's in its pursuit of maintaining political leadership preferences in neighboring Ukraine, for which Russia has been economically sanctioned by the West. Many ironies during the multiple flash points of configuration currently afflicting the Middle East. It's also interesting that the Saudi-led coalition war directed towards Yemen, as well as the military command dispute during the Salahadin campaign in Iraq reported late last week, doesn't appear to have impacted Iran's diplomatic posture during high-stakes nuclear negotiations at Lausanne. The comments are absolutely logical and right.